The modernization of this historic Catholic school campus involves three buildings that were built in 1888, 1916 and 1937. Outdoor seating terraces were created, and the playground, landscaping and street frontages were reconfigured. These site renovations increased usability and accessibility throughout the campus. 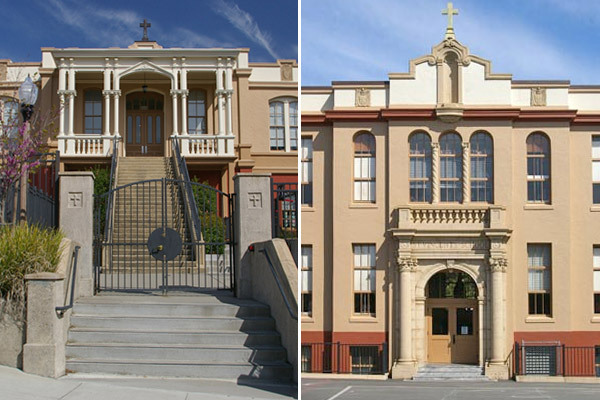 After serving Petaluma for over 120 years, the Academy Building was renovated to house new classrooms, library and a chapel. Improvements included a new stairway, elevator, replacement of all building systems, structural seismic stabilization, new windows and the refurbishment of salvageable historic components. In the future, the remaining buildings will be rehabilitated and expanded to include a 350 person multi-purpose room, stage, kitchen and administrative offices. These improvements will allow St. Vincent de Paul to continue to serve the community.